We support people in breaking silencing and restoring your true Self. All genders are welcome – we use the word “female” because patriarchy’s power and control rose to suppress her voice and power. Invisible to society so accustomed to male leadership, she is suppressed when she rises. If you too are feeling unsettled, angry and depressed after the virulent misogyny and backlash to women’s leadership that resulted in Hillary’s defeat in 2016, the Creative Female Project is for you. As we move forward, we must resist in ways that weaken patriarchy’s power and create in ways that awaken creative female activism to build a new society. Creative female is the inner artist wisdom of spirit, heart, mind, body connection – our inner light and the power to create and nurture our lives and society. For many of us this connection was severed in the corporatism, greed, misogyny, racism and abuse that is present day society. • Restore the voice, power and leadership that patriarchy suppressed thousands of years ago and that continues in present time. Each of us has a unique voice connected to our own female lineage and ancestry. • Live out loud, visible and in full color like the trees whose leaves turn gold, yellow, orange and red in autumn season every year. • Build a society that honors, respects, values, welcomes, loves and nurtures all people, nature and the Earth, our home. Find out who she is and how her voice, power and leadership are rising today. Explore the meaning of creative female in your life, connect with your inner wisdom, hear and affirm your true voice. 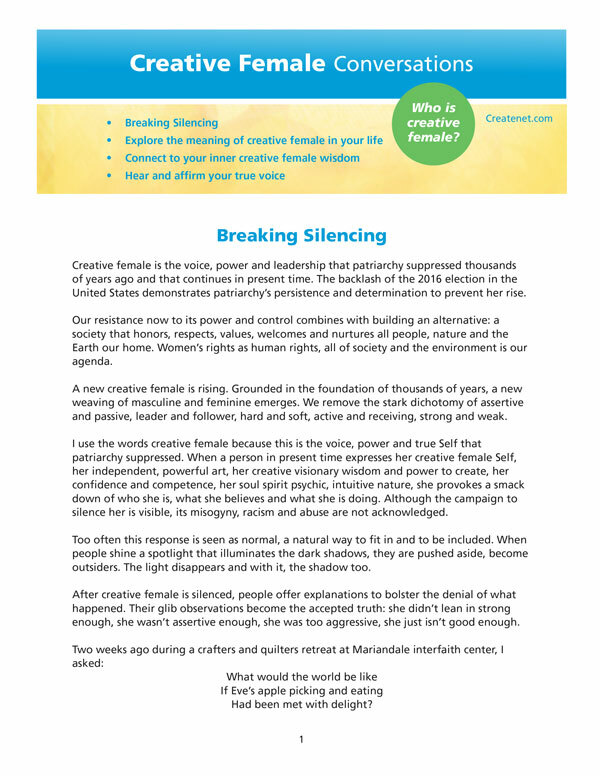 The download includes a description of creative female, discussion topics. a collage-making activity and instructions and readings for a story salon. You’ll also receive tips, tools and guides in your inbox to support you in living the life that you want to create. Join our creative community of kindred people who are creating our lives to make a difference in challenging times. There is a vitality, a life force, a quickening that is translated through you into action, and because there is only one of you in all time,this expression is unique. If you block it, it will never exist through any other medium. It will be lost. The world will not have it. It is not your business to determine how good it is, nor how valuable it is, nor how it compares with other expressions. It is your business to keep it open clearly and directly, to keep the channel open. CreateNet Studio designs and develops projects that create personal and community wellbeing. We offer tips, tools and guides to create a life of meaning and purpose in these challenging times, strengthen creative female voice, power and leadership and learn about how people are having an impact in their communities and how you can too.